Tuesday, March 3 from 7a.m. – 10p.m. 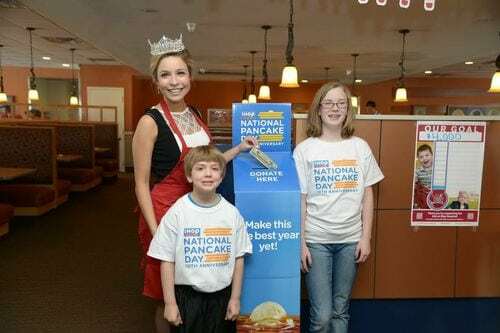 at participating IHOP restaurants across North America, diners can enjoy a free short stack of delicious buttermilk pancakes and leave a donation to help support their local Children’s Miracle Network Hospital. IHOP has given away approximately 1 million short stacks of pancakes on National Pancake Day. That’s 27 million pancakes over the last nine years! If you were to stack all the pancakes that have been given away, they would reach 1.125 million feet. Or as tall as 900 Empire State Buildings. National Pancake Day has happened annually since 2006, raising more than $13 million dollars for Children’s Miracle Network Hospitals. There have been enough pancakes given away that they could stretch side-by-side from Miami to Los Angeles. These might be the most important pancakes you eat all year. Donations raised during National Pancake Day help make miracles happen for sick and injured kids treated at 170 Children’s Miracle Network Hospitals. Kids like Keegan, who was born with a congenital heart defect. Funds help bring a cardiologist to Keegan’s member hospital which allowed him to stay closer to home during his multiple open-heart surgeries. 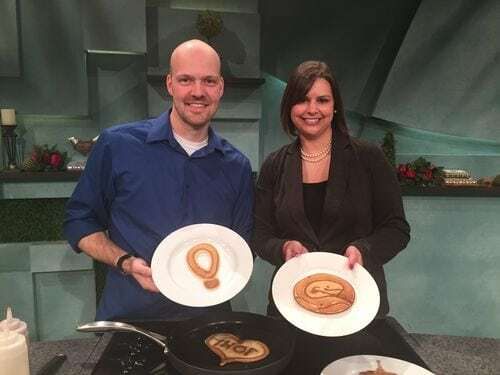 Big shout out and thanks to Miss America 2015 Kira Kasantsev, Nathan Shields (our above pancake artist) and YOU for your support. You can get more information at http://ihoppancakeday.com/. Make sure to tag us @CMNHospitals and #NATLPancakeDay.